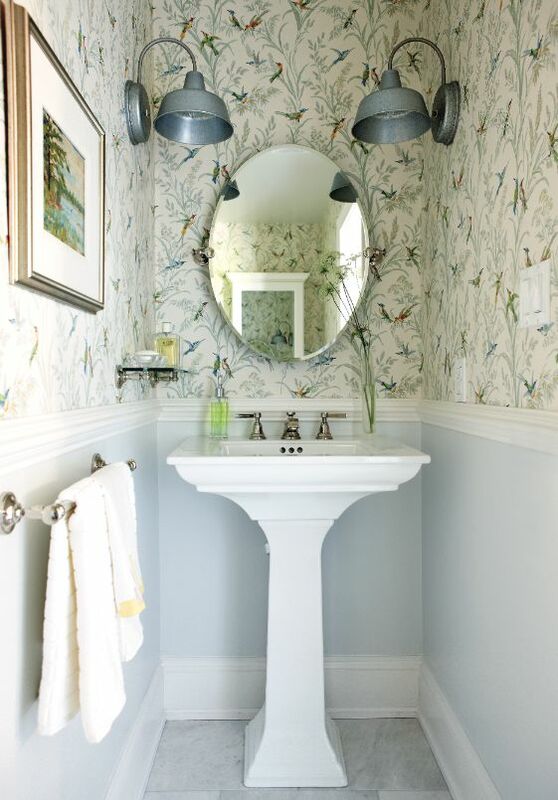 Small space in your house can turn into a stunning powder room. Powder room will help you get ready in the morning when so many people rushing to use the main bathroom. And it’s also a good place that your guest can use when in need. It’s less personal and bound to be practical. 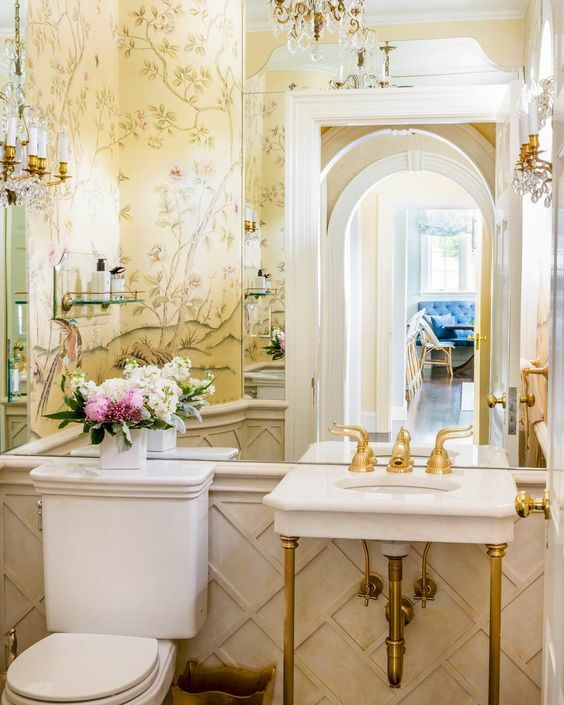 And here below are some stunning powder room. 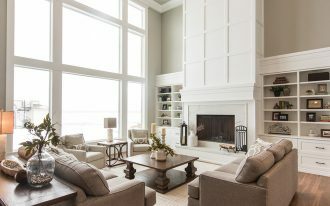 Even though the space is small, it does not mean that it cannot be decorated fully. Seen in this picture, it combines so many interesting textures on he wood, basket, rug, sink, and wall. And not only that. Despite the stark look on the wall and ceiling, the floor brings warmth to the room. The ceiling has an interesting look with LED on it. 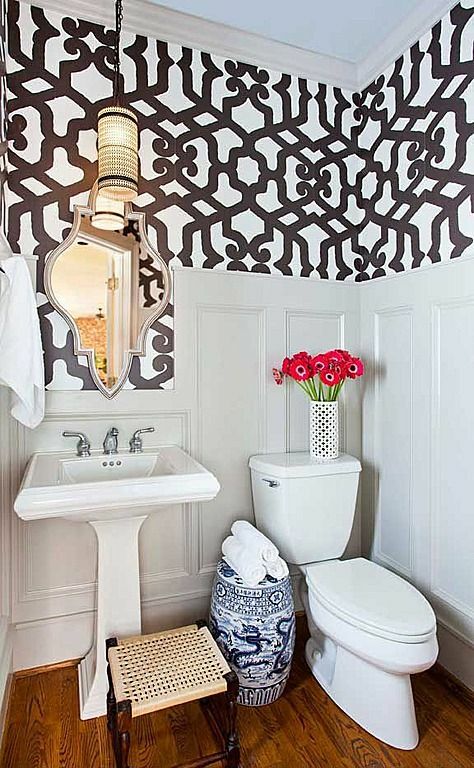 Although it’s a small space, this room has also brought quite interesting elements to the room with its stencil wallpaper, white wainscoting, chevron floor. 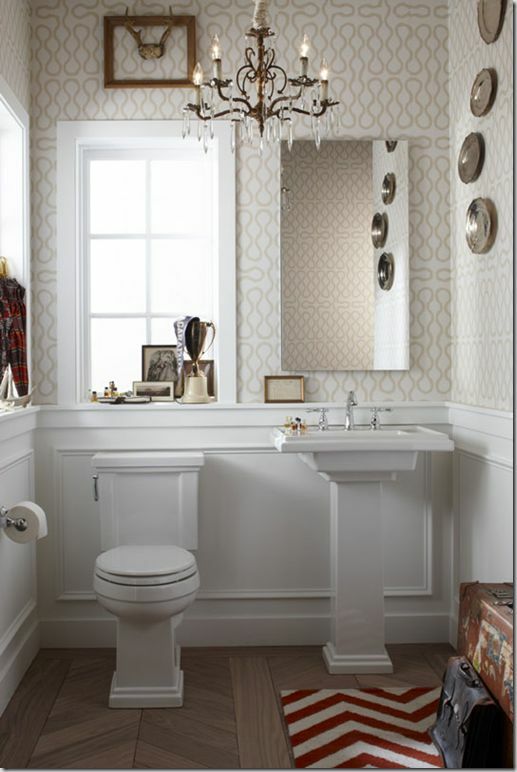 The traditional look on the toilet, sink, and chandelier brings a balance to the modern touch. 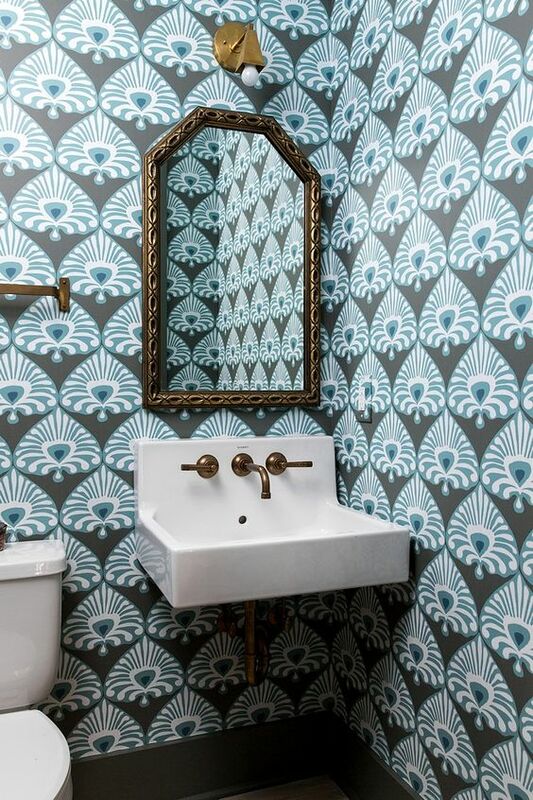 When it needs bolder statement, wallpaper is the easiest go to thing. And this one can show how pretty, soft, and flowery this one here is. 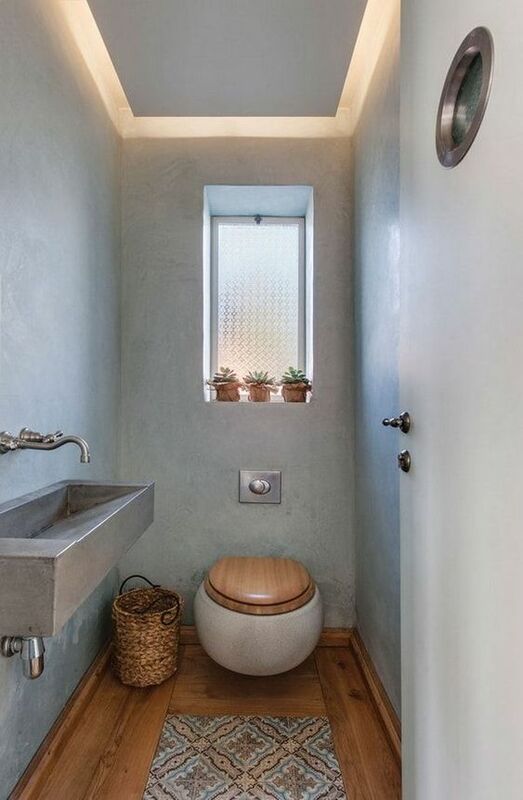 With so narrow space, this one is also able to give a unique touch from the industrial sconces. 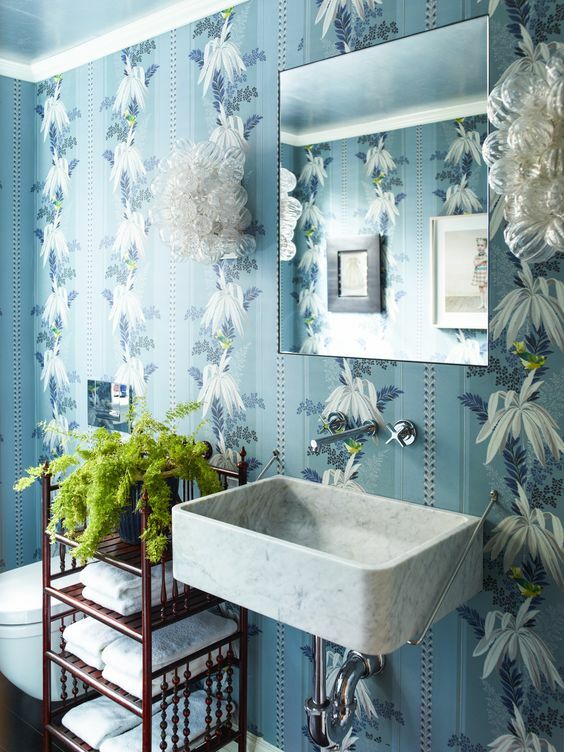 Again, in this powder room, too, small space does not the limit to make creative action. Here seen that to leave strong impression, the room has been wainscoted in really interesting shape. The ikat motif on the wallpaper, Moroccan mirror, and oriental vase are a mix touch from Asian culture that looks great together. Together, it is difficult to say which one that will leave impression the most. 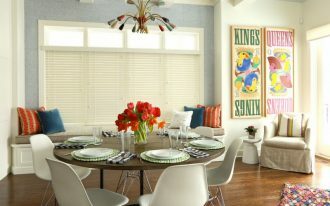 In this one, obviously the blue pattern on the wallpaper looks so strong. 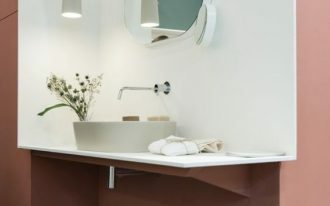 However, the small details of copper in the faucet, rail, mirror frame, sconce are interesting and stand out in their own. 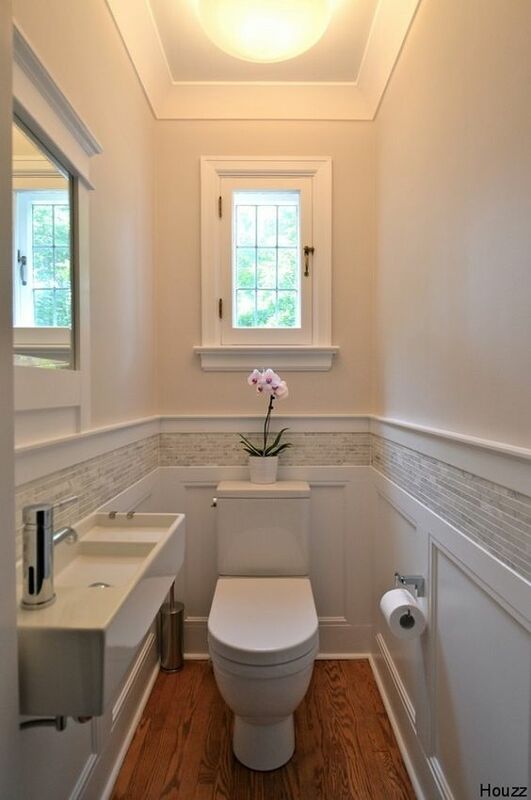 Even in this small bathroom that looks plain white, the details are quite strong. 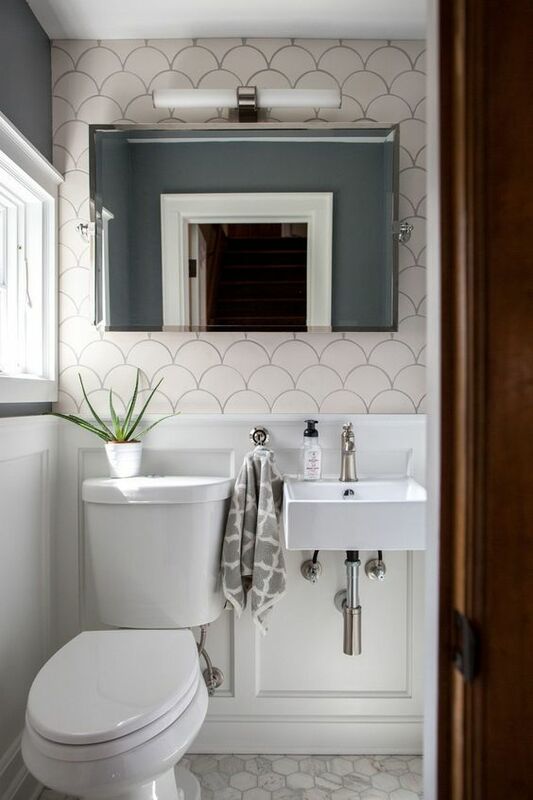 The hexagon floor tiles bring its modern feeling along with the white sink. 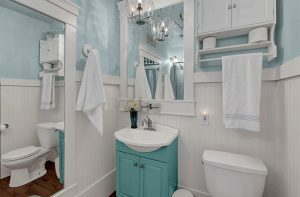 The wainscoting embraces the bathroom in more traditional way while fish scale on the accent wall looks nice and pretty. 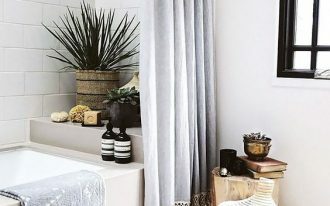 Although the room is petite, this one here successfully turn it into elegant powder room with golden accents here and there. The soft yellow flower wallpaper blends perfectly with this traditional elegance. 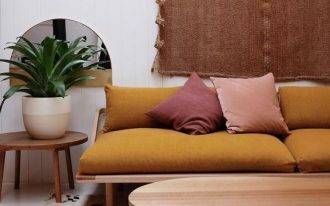 If small space need to be simply treated, this one here can show you how it should be done. 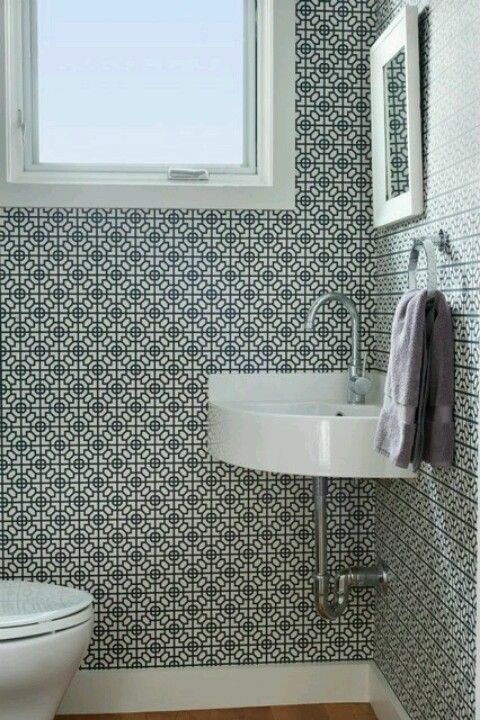 With wallpaper, the impression can be made. And besides that small unusual step can be taken for the sink, small mirror, and towel bar. This one here has a very interesting way to make the room more interesting. With tiles in backsplash that surround the room in a long and thin line. The narrow sink goes with it. And all together compliment the long and narrow room.